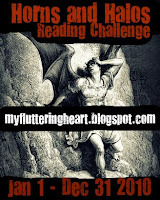 It has been ages, but you might remember that I’m taking part in the Horns and Halos Reading Challenge hosted by Aimee of my fluttering heart. I went fairly angel-happy at the start of the year. Then my interest tapered off, and I went the route of straight fantasy, zombies, and all that other stuff (fairy tales, anyone?). I am determined to finish strong, so when I had the chance to request a copy of Karalynn Lee’s Demon’s Fall from the NetGalley catalog, I took it. When Kenan, an incubus, finds a caged angel for sale in the Hellsgate marketplace, he sees her as a challenge. Certain that his skills in seduction will work as well on a heavenly creature as they do on mortal women, he buys Jahel, intent on having her soul as a novelty in his collection. Knowing he must gain Jahel's trust, Kenan treats her more as his guest than as his slave. When she reveals what brought her to the mouth of Hell in the first place – retrieving the soul of a young girl she was guarding – he even offers to help her complete her mission. Just in case you didn’t catch it in the summary, this is a ROMANCE NOVEL. Adult-level reading. Very scandalous. Well, a story about an angel and a demon falling in love was going to be scandalous anyway…but let’s times that factor by about a hundred for the ess-eee-ex, okay? Okay. If you’re not into it, no worries. But the story’s good. Serious. Kenan is a demon with a lot of allure. Jahel is a caged angel. They meet in a marketplace in Hellsgate, which is just what it sounds like – a city on the edge of the gate of Hell. Kenan has his own reasons for buying Jahel, but the main plot follows their adventures trying to fulfill Jahel’s quest. And that quest…is surprisingly familiar. Throw in a little bit of the fairy tale of Snow White, some of the Biblical apocalypse, and you have our story. Perhaps surprisingly, it’s a mash-up that works. Of course, the focus of the novella is the romantic relationship between the two protagonists. Four words: steamy, and too quick. I’m all for the reforming bad boys cliché, but Demon’s Fall moved at a pretty fast clip in that department. I would have appreciated a little more development, a couple more pages in that section. I wasn’t disappointed, but it was a little thought in the back of my head while I read. Bonus: the secondary characters and setting. This story worked for me mostly because of the wonderful description of Hellsgate, the funny and endearing secondary characters, and how the protagonists interacted with both. Some of the supporting characters provided crucial moments of hilarity in conversation, or made me randomly smile. So that was a huge plus. I can also tell that I love a fantasy setting when I find myself hoping that there will be more books set in that ‘world.’ I’ll say it: I want more! Recommended for: fans of steamy romance, angels, demons, unconventional fantasy mash-ups, and original world-building. Again, an advisory: adult-level reading. I read an e-galley of this book courtesy of Carina Press and NetGalley. Demon’s Fall releases on October 25, 2010. Good review! I agree with you that the romance was too fast. I'd have liked to see some more struggle. Outside my normal realm of reading but it sounds really good. Haven't read any angel books in a while - you've got me thinking I might have to soon!